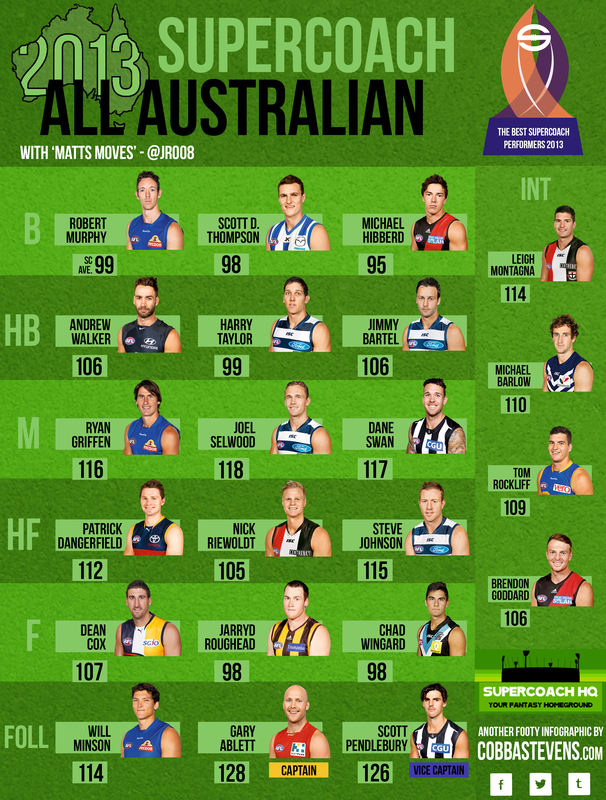 The All-Australian team if never easy to compile. However, using the SuperCoach points system, I have narrowed it down to the final 22 best Fantasy performers of the year. My criteria was based on total games, consistency and big scores. Scott D. Thompson and Harry Taylor were the two top scoring key position defenders this season, so they hold down full back and centre half back. Michael Hibberd and Robert Murphy had fantastic years as medium sized defenders and even though Andrew Walker and Jimmy Bartel aren’t defenders in SuperCoach, they played predominantly down back this year having wonderful seasons, averaging well over 100 SuperCoach points. Will Minson gets the nod, as he is the highest scoring ruckmen this year just ahead of Goldstein who was unlucky to miss out. Gary Ablett, Scott Pendlebury, Joel Selwood, Ryan Griffen and Dane Swan are no-brainers as they have clearly been the top five midfielders this year in SuperCoach. Ablett and Pendlebury were the two highest averaging players, so they are named as Captain and Vice Captain. Jarryd Roughead is an automatic selection because he won the Coleman medal this year and he’s been great this year. Nick Riewoldt averages the most points for a key forward, while Dean Cox sneaks in due to his versatility. He can play in the ruck and up forward, and in modern footy, two ruckmen are essential. Even though Steve Johnson has missed six games this year and he has played mostly as midfielder, we all know how dangerous he is around goals and he is the top averaging forward for the season. Patrick Dangerfield has also played a lot in the midfield this year, but he too has the ability to play up forward and he can’t fit in the midfield in this side, so he would be pushed up forward. Chad Wingard has had a massive year, in only his second year of senior football and he has kicked 43 goals for the year and he averaged 98 points a game, making him the best scoring small forward in SuperCoach. These are ‘the best of the rest’. Leigh Montagna had a fantastic season and was unlucky to make it in the starting eighteen, while Michael Barlow was unlucky too. Tom Rockliff and Brendon Goddard add some versatility to the side, as Rockliff can play in the midfield or up forward, while Goddard can play down back or in the midfield. The SuperCoach Brownlow medal is all about who performed the best this year, using SuperCoach points as an indicator to who gets the votes. 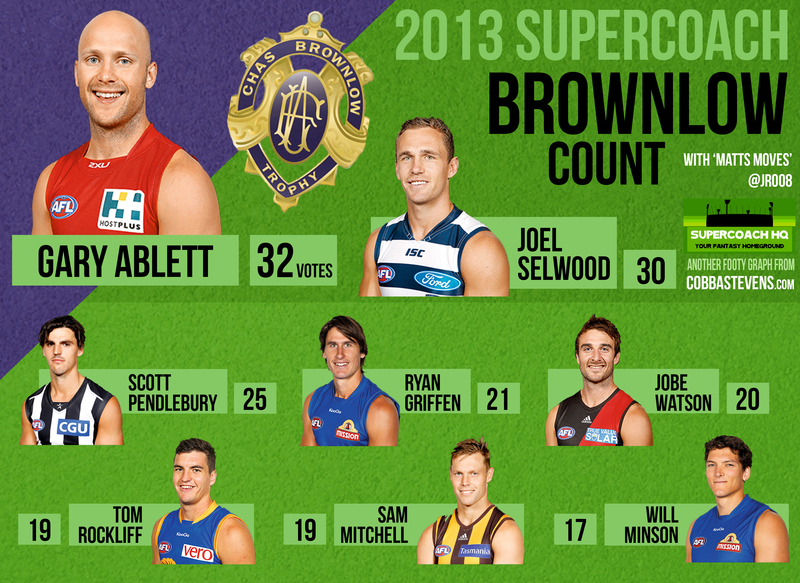 Brownlow votes are handed out to the top three SuperCoach scorers for every game in the 2013 AFL home and away season. The SuperCoach Brownlow medal, like most other AFL awards, is a medal dominated by the midfielders. The top 7 players in the SuperCoach Brownlow are all midfielders, but nonetheless they have all had fantastic years. Gary Ablett takes home his second consecutive SuperCoach Brownlow Medal, just ahead of Joel Selwood, who was leading before the last round of the year. Gary pipped him with a massive three-vote game against the Giants, in round 22.